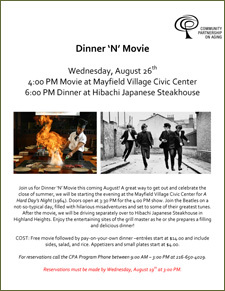 Meet CPA at Mayfield Village Reserve Hall Theater in the Civic Center on August 26th 2015 for The Beatles’ hilarious antics in “A Hard Day’s Night” then drive on over to Hibachi Japanese Steakhouse in Highland Heights! Doors for the 4:00 showing of “A Hard Day’s Night” open at 3:30, and dinner at Hibachi will follow. Meal options at Hibachi start at $4.00 for appetizers or dinner entrees for $14.00. Movie is FREE but reservations for both are required. Please call (216) 650-4029 for reservations (ask for Therese). Dinner reservations are limited to 30.